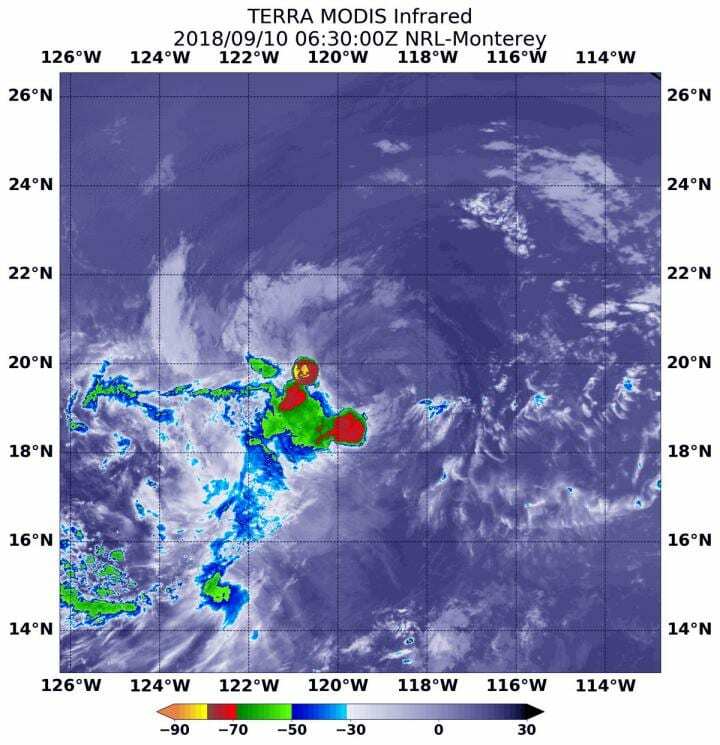 Infrared imagery from NASA's Aqua satellite showed that newly developed tropical storm Paul in the Eastern Pacific is dealing with wind shear. Tropical Depression 18E formed on Saturday, Sept. 8 at 11 a.m. EDT and strengthened in a tropical storm on Sept. 9. Infrared satellite data at 2:30 a.m. EDT (0630 UTC) on Sept. 10 from the Moderate Resolution Imaging Spectroradiometer or MODIS instrument aboard NASA's Aqua satellite revealed the strongest storms in Tropical Storm Paul were displaced from the center. MODIS found coldest cloud tops had temperatures near minus 70 degrees Fahrenheit (minus 56.6 degrees Celsius) being pushed southwest of the center from northeasterly vertical wind shear. NASA research has found that cloud top temperatures that cold have the capability to generate heavy rainfall. The National Hurricane Center noted "Paul continues to have its low-level center displaced on the northeast side of the main area of deep convection. This convection is not well organized and there is little or no evidence of banding features." At 11 a.m. EDT (1500 UTC) on Sept. 10 the The National Hurricane Center of NHC noted the center of Tropical Storm Paul was far from land and located near latitude 20.8 degrees north and longitude 120.7 degrees west. That's about 705 miles (1,140 km) west of the southern tip of Baja California, Mexico. Paul is moving toward the northwest near 10 mph (17 km/h), and a turn toward the west-northwest is expected by tonight. Maximum sustained winds are near 40 mph (65 kph) with higher gusts. Weakening is forecast, and Paul is expected to become a remnant low in a few days.